Hali Bernstein Saylor/Boulder City Review Siblings Lexie, 5, and Gary Wentz, 6, of Boulder City are on a mission to visit every national park and stopped by Lake Mead National Recreation Area on Saturday to participate in Junior Ranger Day activities, including coloring pictures of wildlife found in the park. Hali Bernstein Saylor/Boulder City Review Jennifer Bailard and Michael Steiner of the Mojave Desert Network brought springsnails and aquatic insects for children to study during Junior Ranger Day activities at Lake Mead National Recreation Day on Saturday. Here, Izabella and Josiah Jennings of Kansas City, Missouri, get an upclose look at the snails and insects. Their family was camping in the park as they travel across the country. Hali Bernstein Saylor/Boulder City Review Stephanie McMartin, left, junior ranger ambassador for Lake Mead, helped her mother Sylvia McMartin check in prospective junior rangers during Saturday's kickoff for National Park Week. About 500 people attended and more than 200 new junior rangers were swore in. Hali Bernstein Saylor/Boulder City Review Bob Cromley and Wendy Park of the U.S. Coast Guard Auxiliary joined Coastie, the talking boat, to provide information about water safety during Junior Ranger Day on Saturday at the Alan Bible Visitor Center at Lake Mead National Recreation Area. Hali Bernstein Saylor/Boulder City Review Aries Denning, 10, of Las Vegas, learned about fossils found at Tule Springs Fossil Beds National Monument Superintendent Diane Keith. 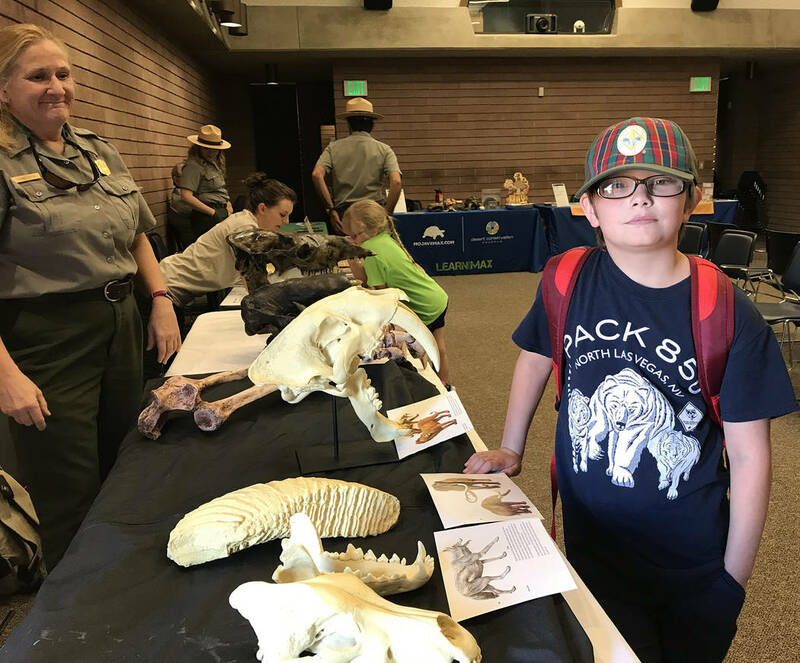 Aries was on a quest to become a junior ranger during the kickoff event to National Park Week at Lake Mead National Recreation Area on Saturday. Hali Bernstein Saylor/Boulder City Review Eight-year-old Demetrius Wiest of Las Vegas gets a lesson on how to fish from Craig Schweisinger, a volunteer instructor for the Nevada Department of Wildlife, during Junior Ranger Day activities at Lake Mead National Recreation Area on Saturday. Hali Bernstein Saylor/Boulder City Review Friends Cassie Lustig, 4, and Samuel Alexander, 5, of Las Vegas, came to Lake Mead National Recreation Area on Saturday to participate in Junior Ranger Day activities. Hali Bernstein Saylor/Boulder City Review Posing for a picture with Mojave Max, the mascot for the Clark County Desert Conservation Program, were, from left, P.J. Alexander, Evan Shumway, Gwen Shumway and Jeus Holland, all of Las Vegas. 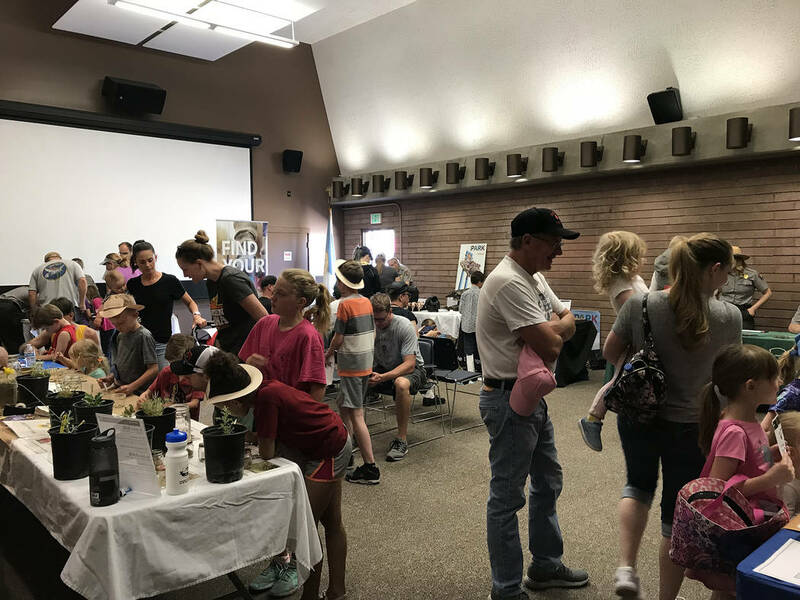 They were among those who came to the Alan Bible Visitor Center at Lake Mead National Recreation Area on Saturday to participate in Junior Ranger Day activities. Hali Bernstein Saylor/Boulder City Review A variety of exhibits and hands-on activities designed to teach children and others about Lake Mead National Recreation Area and how to spend time outdoors safely was featured during Junior Ranger Day on Saturday at the Alan Bible Visitor Center. The celebration kicked of National Park Week. 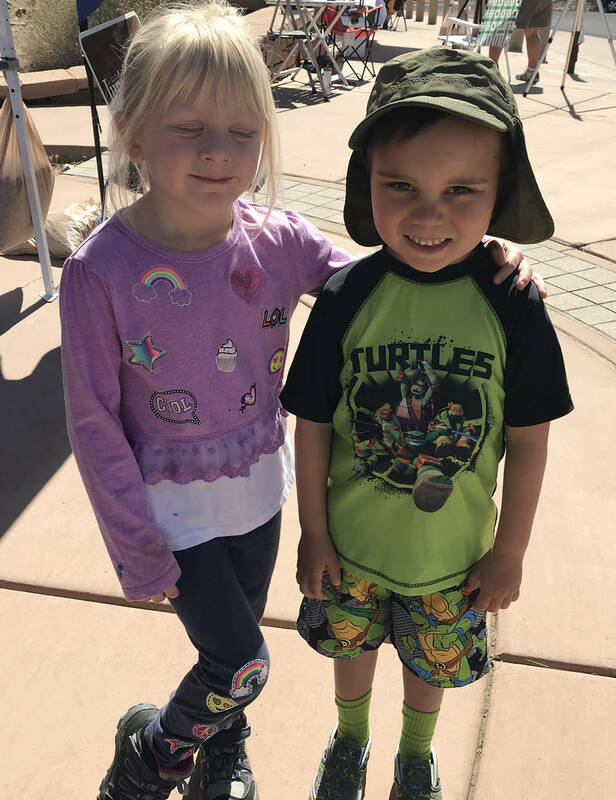 Siblings Lexie, 5, and Gary Wentz, 6, of Boulder City are on a mission to visit every national park and stopped by Lake Mead National Recreation Area on Saturday to participate in Junior Ranger Day activities, including coloring pictures of wildlife found in the park. 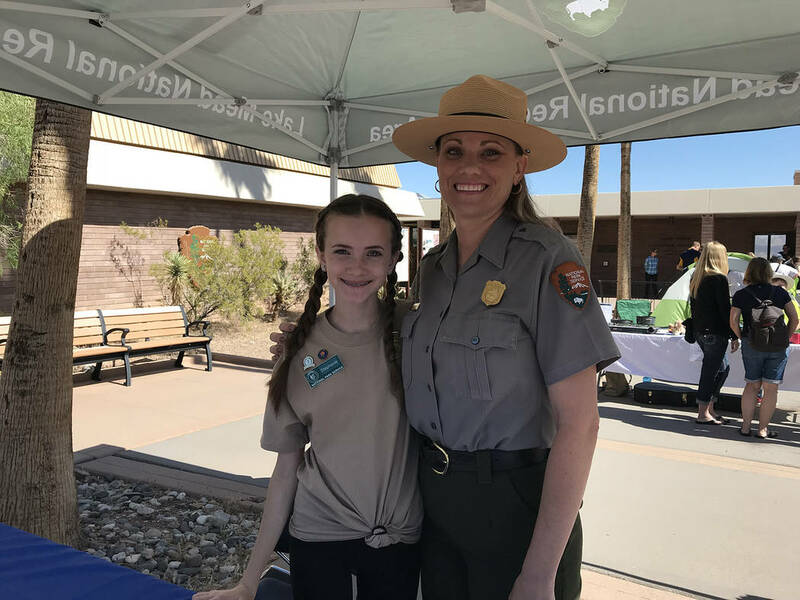 Stephanie McMartin, left, junior ranger ambassador for Lake Mead, helped her mother, Sylvia McMartin, check in prospective junior rangers during Saturday’s kickoff for National Park Week. About 500 people attended and more than 200 new junior rangers were swore in. 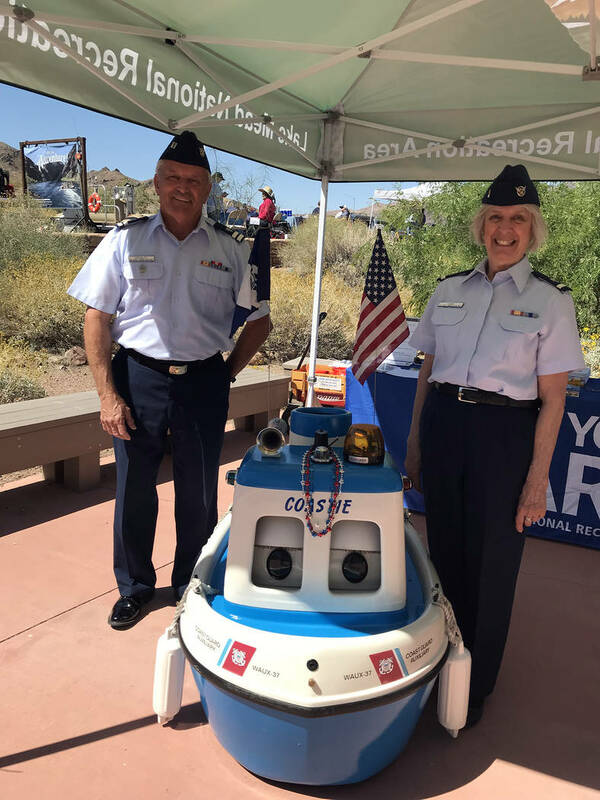 Bob Cromley and Wendy Park of the U.S. Coast Guard Auxiliary joined Coastie, the talking boat, to provide information about water safety during Junior Ranger Day at the Alan Bible Visitor Center at Lake Mead National Recreation Area. 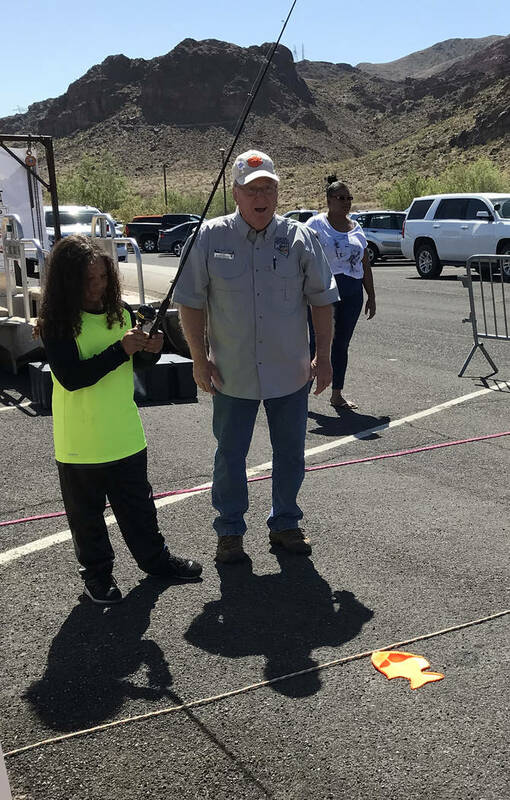 Eight-year-old Demetrius Wiest of Las Vegas gets a lesson on how to fish from Craig Schweisinger, a volunteer instructor for the Nevada Department of Wildlife, during Junior Ranger Day activities. Aries Denning, 10, of Las Vegas learns about fossils found at Tule Springs Fossil Beds National Monument from Superintendent Diane Keith. Aries was on a quest to become a junior ranger during Saturday’s kickoff event for National Park Week. Friends Cassie Lustig, 4, and Samuel Alexander, 5, of Las Vegas came to Lake Mead National Recreation Area to participate in Junior Ranger Day activities. From left, P.J. 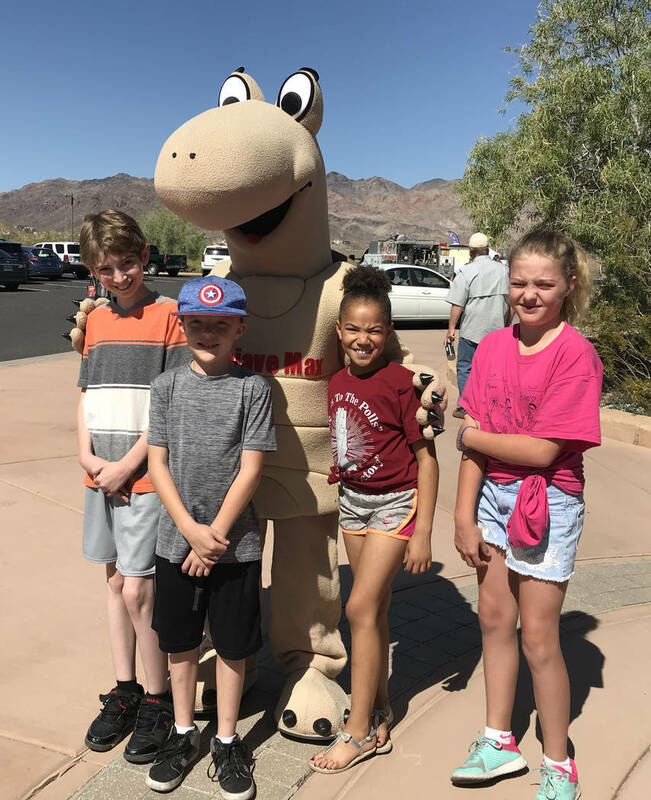 Alexander, Evan Shumway, Gwen Shumway and Jeus Holland, all of Las Vegas, pose for a picture with Mojave Max, the mascot for the Clark County Desert Conservation Program. They came to the Alan Bible Visitor Center to participate in Junior Ranger Day activities. 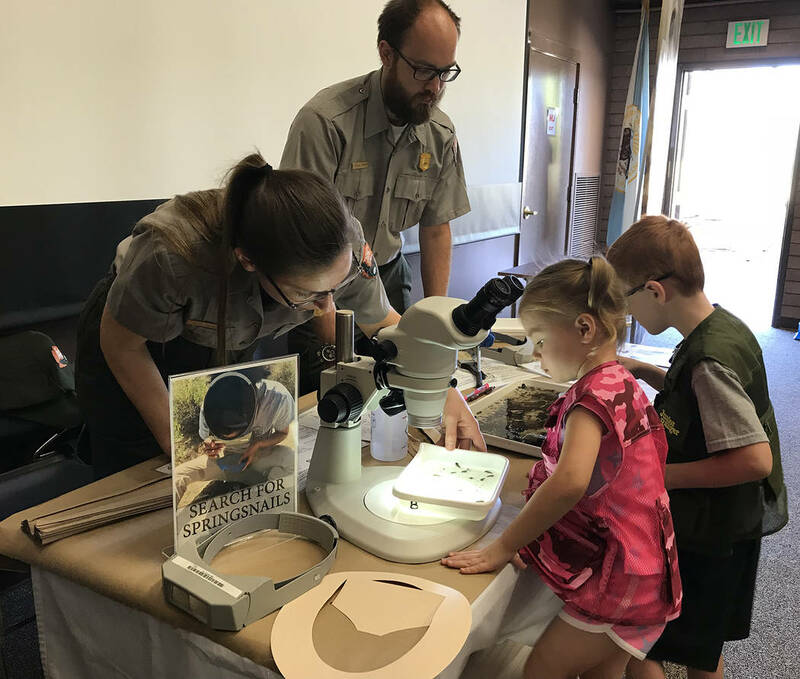 Jennifer Bailard and Michael Steiner of the Mojave Desert Network brought springsnails and aquatic insects for children to study during Junior Ranger Day activities at Lake Mead National Recreation Day on Saturday. Here, Izabella and Josiah Jennings of Kansas City, Missouri, get a close look at the snails and insects. Their family was camping in the park as they travel across the country. 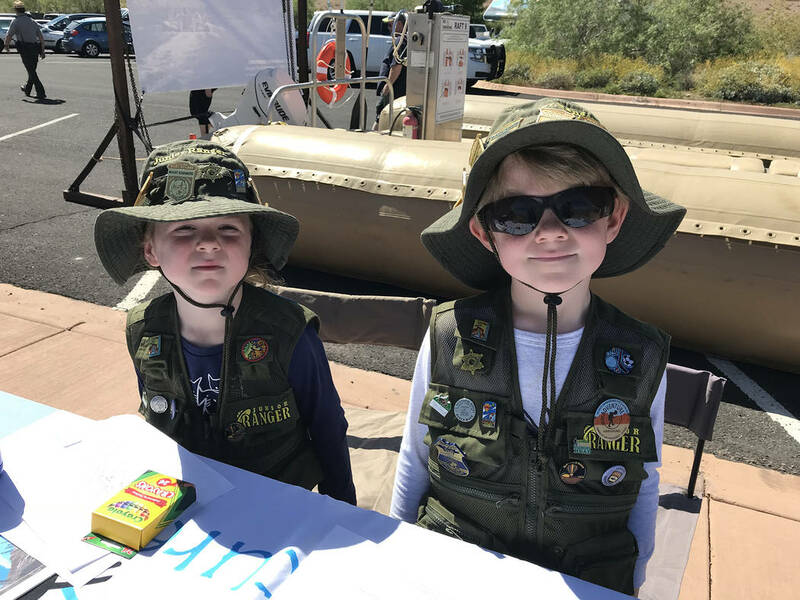 A variety of exhibits and hands-on activities designed to teach children and others about Lake Mead National Recreation Area and how to spend time outdoors safely was featured during Junior Ranger Day. About 500 people attended and more than 200 new junior rangers were swore in.